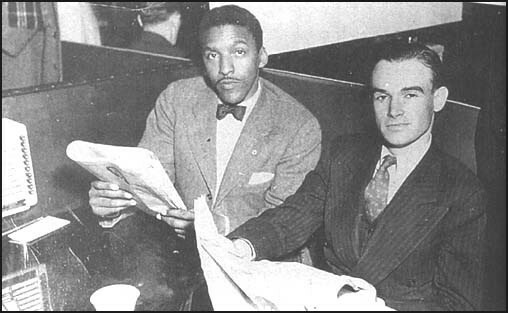 This is a photo of Bayard Rustin (Black male) and George Houser (White male). Rustin’s relationship with CORE can be confusing. According to Houser, Rustin was not a founding member of CORE, as many authors have stated. According to Rustin in his own oral history, he was imprisoned from 1942-45. Both men, heavily influenced by Ghandi, were field secretaries with the Fellowship of Reconciliation which allowed them to help build CORE at the same time. While Houser was its head, Rustin identified himself as field director from 1945 to 1955 travelling across the country creating demonstrations. James Robinson in an interview described Rustin as ‘an uncle of CORE’. Others who knew him as a central member of their New York group of CORE people during the 1940’s and 1950’s described him ‘as a force in and of himself’. Regardless Rustin played a vital role in the growth CORE and is central to its history. 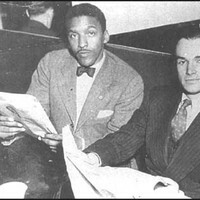 “photo of George Houser and Bayard Rustin,” corenyc.org, accessed April 21, 2019, http://www.corenyc.org/omeka/items/show/188.